What to do with my aging UPS? It’s a question that vexes companies and individuals who rely on equipment-protecting systems to ensure hardware is fully operational and data is readily accessible. But a UPS is often a significant investment that poses a challenge as it gets older. If you want to handle your UPS’s golden years in a way that maximizes its life and saves you money, keep reading for some of our favorite tips. Let’s start here: Are you properly maintaining and servicing your old UPS? It sounds obvious, but many individuals install their UPS systems and let them run until they receive an alert that signals instability or waning battery life. Make sure you’re testing your system on a regular basis — once or twice a year. During an outage, your UPS can overstate its remaining run time, which can lead to an unexpected shutdown. When you get an authentic low-battery warning, this is the time to order your replacement battery. You can find full RBC battery kits that make installation simple, and many UPS systems allow for hot-swaps that continue protecting your equipment while you’re between batteries. There are multiple reasons why a battery’s life diminishes before its time: harsh closet temperatures, poorly calibrated charging circuits, excessive use, sulfation, etc. Many users will simply replace the battery, but there’s an unfortunate catch. Your new battery’s life will quickly diminish for those same reasons, and the continued use may actually damage your unit. So, what about when the problem IS the battery and it needs to be discarded? A battery should not under any circumstances go in the garbage, as each trashed battery emits toxins into the environment. When you properly recycle your UPS battery, you are doing the environment a favor. Always recycle your old UPS battery. Even if you properly service and maintain your UPS by testing and replacing its battery regularly, the day will come when you need a replacement unit. You can certainly purchase a new UPS at a significant cost. However, there’s another path that gives you access to like-new performance at a fraction of the price: refurbished UPS systems. By refurbishing rather than replacing new, you get the economic benefits as well as recertification by the CoastTec team — a thorough process that ensures correction of the conditions that are draining your battery’s life prematurely. Your battery and unit will be protected, and you can enjoy the benefits of a warranty. When the refurbishing process is conducted by certified technicians, the final product will perform as well as a brand new model. Much like recycling your battery, purchasing a refurbished UPS offers several benefits. It offers a lower price, of course, and it also prevents environmentally harmful equipment from ending up in a landfill where their toxins do harm. When you consider a refurbished UPS, you’ll enter into a lifecycle that allows you to recycle old UPS units and get like-new systems at lower prices — time after time. You’ll save significant money in both the short- and long-term which is crucial for any business. CoastTec is your source for refurbished UPS systems and accessories. 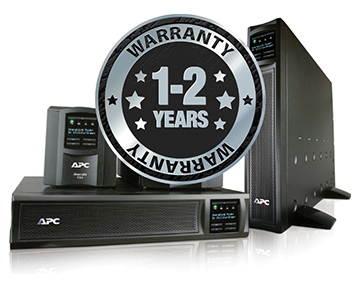 We’re the only APC-certified refurbisher of single-phase units, and our team of APC-certified technicians completes 30 checks and reconfigurations to ensure you’re getting an outstanding product — a like-new UPS with an extended lifespan of three to five years. We are also the only company with access to APC’s engineering change orders, which means we can offer unique value through refurbished systems that meet manufacturer standards. As an extended guarantee, each of our refurbished products also features a one-year warranty. Save money and do the environment a favor when you choose CoastTec, the company that can restore old UPS units to like-new condition. Are you interested in the power of a refurbished UPS? Contact us today at info@coasttec.com or 410-521-1000.